The FRITZ!Box parental controls not only allow you to limit internet access time, you can also completely block particular applications (for example online games) from accessing the internet. You can use access profiles to specify which blocks apply to which devices. Important:To bypass internet blocks, some applications (for example TeamViewer, Messenger) are capable of using the ports used to surf the internet instead. Therefore, the FRITZ!Box cannot block only this type of application from using the internet. Instead, block internet access for the respective device or set up a firewall on it. You can only block applications that exclusively use the TCP and UDP protocols. Applications cannot be blocked if the FRITZ!Box uses the internet connection of another router. In this case, regulate internet use in the other router. Determine which ports and IP protocols the application uses. Refer to the manufacturer for this information, for example consult the manual. 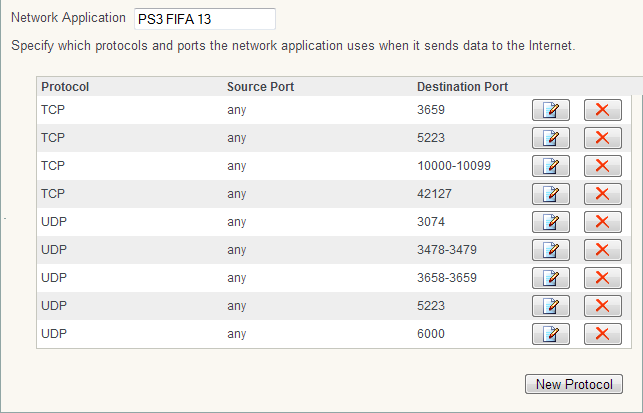 Note:You can find a non-binding overview of the ports used by many applications at www.portforward.com. Click the "Add Network Application" button in the "Network Applications" section. If the button is not displayed, enable the Advanced View first. Note:Several applications are preconfigured in the FRITZ!Box. Click the corresponding (Edit) button if you would like to customize them. Enter the name of the application in the "Network application" field. Click the "New Protocol" button. Select the protocol used by the application to send data to the internet. If you selected TCP or UDP, enter the source port(s) and destination port(s) used to establish the connection. If the application uses different protocols and/or ports, repeat steps 6 - 9 for these as well. Select the applications you want to block from the drop-down list "Block network application". If the drop-down list is not displayed, enable the Advanced View first. The application is now blocked. Restart the FRITZ!Box so that the filter also applies to devices that accessed the internet while you were configuring it. Note:The "standard" profile is valid for all devices in the home network that have not been assigned to a specific access profile, and is automatically assigned to all new devices in the home network. Click on the "Access Profiles" tab and then the (Edit) button for the "Standard" profile. Enable the option "never" in the "Time Limit" section. To prevent the FRITZ!Box settings from being manipulated, protect access to the FRITZ!Box with a user name and/or password. Click on the "Login to the Home Network" tab. If each user should use a unique password to access the FRITZ!Box, enable the option "Login with FRITZ!Box user name and password". If all users should use the same password to access the FRITZ!Box, enable the option "Login with the FRITZ!Box password" and enter a password that will be required to access the FRITZ!Box user interface.